By taking responsibility for the stuff you consume (what you choose to buy and use) you can have a real positive impact on our environment. •	Remember to rinse clean all plastic, glass and metal containers to ensure they are processed for recycling. Leftovers and oily residues cause problems for recyclers. 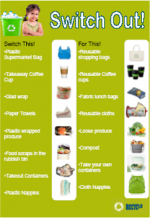 •	Take reusable bags with you when shopping for groceries and gifts. •	When going to the beach, or out for a picnic, bring all your recyclables home with you to be sorted & recycled properly rather than throwing them in the general waste bins, the contents of which go straight to landfill. •	Rather than buying single-use, disposable crockery and cutlery, opt for compostable, or reusable alternatives. •	If everything doesn't fit in your recycling bin when collections resume, store it until the next collection, and place in your recycling bin, not the rubbish bin. •	Wherever possible, choose products without any packaging, or make sure all packaging is recyclable. Avoid products with excessive, non-recyclable packaging. •	Buy only the food you need, and make sure to compost any scraps & use quality leftovers for a meal next day. Click below to view our YouTube video on the importance of recycling in NZ. It provides a simple overview of the waste problems we are facing in New Zealand and shows you how you can do something to help solve these problems. Please share the video with others to help spread the message. Simply by being a part of the modern consumption economy, it is near impossible to avoid sending at least some waste to landfill. However, there are plenty of success stories of kiwis making a real difference by reducing their total waste to landfill just by being mindful of their purchases and recycling or composting everything that they can. Some of these success stories can be found on our Great Kiwi Recycling page. - Is the packaging 100% recyclable? - How far did this product have to travel to make it onto the shelf? - Has this product been sustainably and ethically produced? - Can it be used again or could it be useful for someone else? - Can it be recycled or composted? Once something is in the landfill that is the end of its use and life. You are responsible for choosing what, and how much, you buy, and for making sure the waste can be diverted from landfill. Every little bit we do can make a difference. Be a responsible Kiwi - recycle anything and everything you can. This poster is ideal for leaving near the fridge or food pantry as a reminder of good recycling practice. Download our simple Switch Out guide, switch from non-recyclable products to sustainable products. This 2.5 minute video provides a great overview of why more recycling is needed in NZ and how we should go about it. It highlights the link between consumption and waste problems, and the impact this has on sustainable living and our environment. This video provides a simple explanation of how rethinking normal linear production methods can lead to much more efficient and less wasteful practices. We need to try our best to limit what we send to landfills as they are detrimental to our environment. This short video explains how they work and why they're bad.